Special 4-3 is the third level of Special 4 in Super Mario 3D Land. It is loosely based off World 6-1 and Special 1-4. 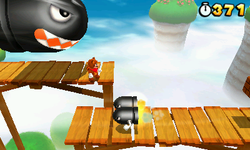 The player starts out on a grassy platform that leads to a bridge with two Flophoppers and four Brick Blocks on it, the final Brick Block contains a power-up. The player will then jump over a narrow grassy platform and onto another bridge that has more Flophoppers. The player will then jump onto another bridge and Bullet Bills will start firing, by this bridge is a grassy platform and at the end of it the player can jump back onto the bridge and through a Red Ring which will spawn five Red Coins, if the player collects them all in time they will receive either a Boomerang Flower or a 1-Up Mushroom. The player will then cross another bridge before dropping down onto another bridge that has three Brick Blocks and a ? Block that contains a Boomerang Flower. The player will then jump onto another bridge before going over some grassy platforms whilst being chased by Banzai Bills. The player will then drop down to another bridge before jumping to a large wooden platform that has two Fire Piranha Plants and a Boomerang Bro. The player will then cross to another grassy platform that leads to the Goal Pole. Star Medal 1: In the waterfall before the Red Ring. Star Medal 2: In between two grassy pillars. Star Medal 3: Underneath the platform leading to the Goal Pole.